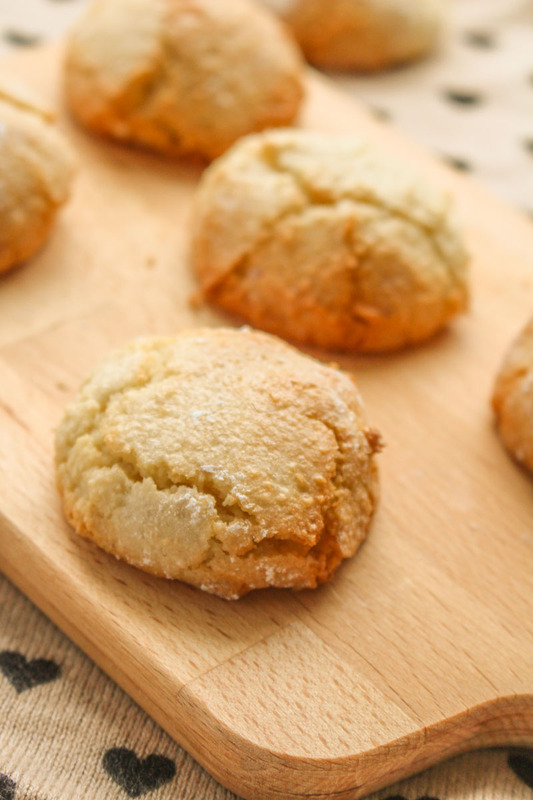 Morning everyone 🙂 Today I’m bringing you sweet and soft amaretto cookies, which include a generous helping of my alcohol of choice – Disaronno. Just a quick post today – I’ve reached the stage in the wedding planning process where my to-do list is becoming more of a to-do book. 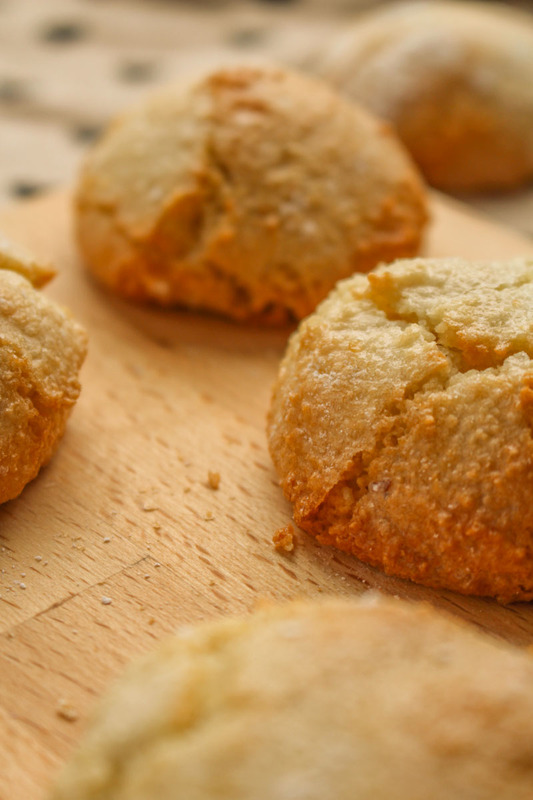 Luckily, these soft amaretto cookies are a super quick one-bowl recipe. Perfect for when you want home-made biscuits, but just don’t have the time or energy to deal with rolling out or cookie cutters (or washing up). These little biscuits aren’t hard and crunchy like some amaretto cookies, but instead have a perfectly soft marzipan flavoured inside, hidden beneath a crispy shell. And I do love me some marzipan. I was inspired to make these from reading this post from Charlotte’s Lively Kitchen (different Charlotte). I played around with the ratios a little, hoping to make them as soft as I possibly could. I also bumped up the level of booze in these, because that’s just how I roll. Speaking of rolling, you are going to want to roll these in some caster sugar, followed by some icing sugar, to get them extra crispy on the outsides. Do it in that order, or the icing sugar will just absorb into the cookie before it’s baked. Yes, learn from my mistakes guys. 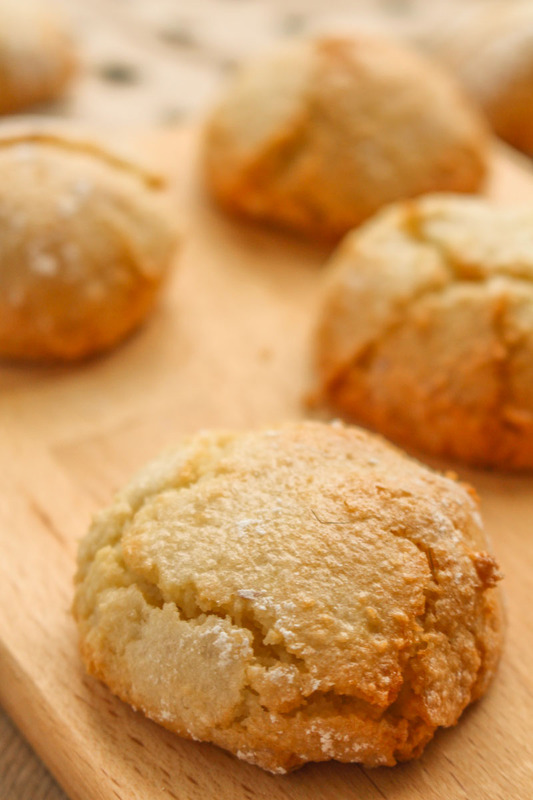 Soft and scrumptious ameretto flavoured cookies. The perfect accompaniment to a mug of hot coffee. 2 tablespoons amaretto - be generous! Preheat the oven to 170°C/340°F/150°C fan, and line a couple of baking sheets with parchment or greaseproof paper. Whisk the egg whites using a stand or electric mixer, until stiff peaks form. Fold the almonds and caster sugar into the egg whites, making sure to be as gentle as possible so not to remove all the air from the mixture. Add in the amaretto, and mix gently until fully incorporated. Roll the mixture into balls (a bit smaller than a golf ball) with your hands. Roll each ball in caster sugar, and then icing sugar. Place the balls onto the baking parchment, and bake in the oven for 20-25 minutes, or until golden brown. The balls will feel soft, but they will harden a bit whilst cooling. Remove from the oven and leave to cool on the baking sheets. These cookies will stay soft for at least a week if stored in an air tight container in a cool place. They can be frozen for up to 3 months - just remove from the freezer a few hours before eating. I always put booze in if at all possible. Sometimes even if not!